One of the joys of living in this city is being able to capture fantastic video clip on the street. Construction is everywhere. Kids are wonderful subjects along with the Mimes , street vendors, beautiful churches and of course my favorite cows grazing in front of my condo rental. We are having a challenge convincing some important people in our lives to come visit us in Cuenca so Sharon and I created this video of our barrio (neighborhood). The video is a little longer than most of the videos I create but I think it’s worth a view because of Sharon’s sense of humor and insight. On the left hand side of Doce de Abril (going up river) there were more crafts. 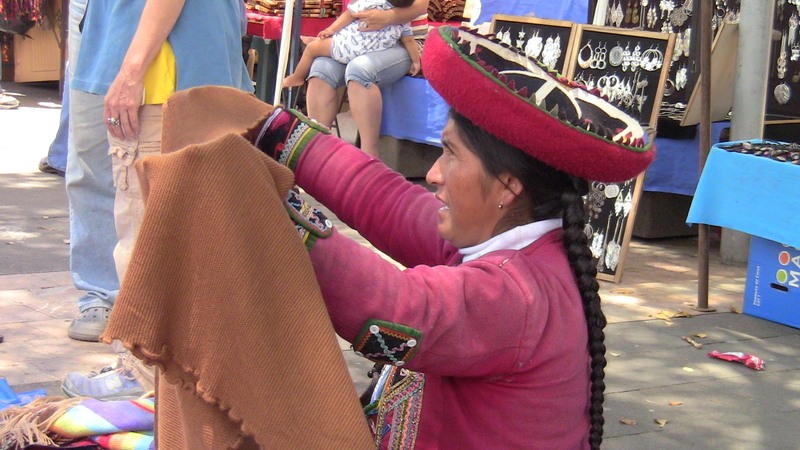 Mostly they were Peruvians selling their Alpaca sweaters. I even noticed a vendor that I purchased an Alpaca sweater in Nov. 2011. Doce de Abril is Founding Day in Cuenca. The city was named in 1557 thus making it 455 years old. There are lots of celebrations, parades, fireworks and craft shows. The holiday lasts 4 days and today I walked from home to the Coopera food market (about 3 miles). I always enjoy the buzz of the city but especially today since there were so many people on the street. I would like to invite some comments and conversation about the first 21 second of the video. There is a local street vendor entertaining the traffic on Doce de Abril y Solano. That is not uncommon but off camera when I gave her a coin I asked the young entertainer her age and she is 8 years old. 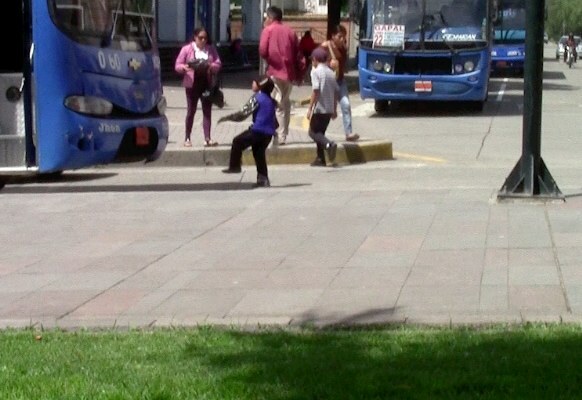 I take my HD Camcorder on the streets of Cuenca and shoot some video for 30 minutes near Parque Calderon. I try to capture a combination of tourist and Cuencanos. The biggest problem was dodging the people and taxis. Please answer the poll question at the bottom of the post.